The rules changed on July 1st of this year and while many of you were pleased the government was introducing Superannuation Guarantee (SG), an increase from 9 per cent to 9.25 per cent per annum there are some workers who will feel the pinch. As reported in the Australian Financial Review (AFR) if you’re on a salary package, or your employment agreement states that your salary “includes” your super entitlements then you could be getting less pay as a result. Many employees have received news their employers will not be footing the bill for the legislated increase in superannuation payments and therefore, these will come directly from the employees’ current pay packets. In simple terms employers are cutting your cash rather than increasing workers remuneration by the 0.25 per cent SG increase. The worst part is whatever decision is made requires no transparency so, next time you check your bank statement you could find there’s less to cheer about. If your salary package “includes” super, then your employer can cut your cash salary to comply with the extra 0.25 per cent in contributions. The key when negotiating your salary package with a potential employer is to always discuss the salary you require with “plus” super attached, this will ensure your protection against legislation such as the SG. Therefore, if your current salary agreement states “plus” super then the SG increase means more super benefits with no change to your cash salary. For those who may be affected by a cash cut due to the new legislation, you may be wondering how this can happen and why doesn’t my employer have to comply with the rules? It all comes down to the salary agreement and whether the salary package is truly a fixed package. However, you are allowed to negotiate with your employer if you want to get the benefit and reap the SG rewards. For those who are on packages subject to individual pay negotiations find out what the employer intends to do about the rise in super now, rather than waiting until the next pay review. Closely examine your contract and see how the super exert is worded. Additionally, you can claim back the commissions you currently pay on your superannuation through YourShare. YourShare is Australia’s leading Cash-back service provider and five-time Money Magazine winner. You could be eligible to receive thousands of dollars every year. By re-investing this Cash-back into your superfund, you can significantly boost your retirement savings. YourShare works with a wide range of financial products including various insurances, home loans and managed funds, so start claiming back what’s rightfully yours. 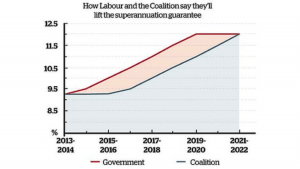 Courtesy of Sydney Morning Herald – The two-party path to a 12% guarantee. Both Labor and the Collation are committed to increasing the SG over the next few years until it reaches 12 per cent, although each have a different timeline for reaching this 12 per cent. This means there will be greater financial implications for affected employees’ over the course of the next six years (or over ten years if the Coalition wins the federal election). Leave a comment and let us know your situation with regards to the Super Guarantee.